My first Oskar Blues experience was courtesy of a Dale’s Pale Ale which I had on tap at The Pourhouse in Westmont, NJ. I liked it so much that I had to pick up a 6-pack the next weekend. This past Saturday night, I was expecting some company to watch the San Francisco Giants/Philadelphia Phillies game, so I thought I would pick up some more Dale’s Pale Ale. Unfortunately, the liquor store that I went to only had the Oskar Blues Gordon Ale in stock. Since I’d already dragged my son all over South Jersey, I couldn’t subject him to yet another stop, so I picked up the 4-pack of Gordon Ale. 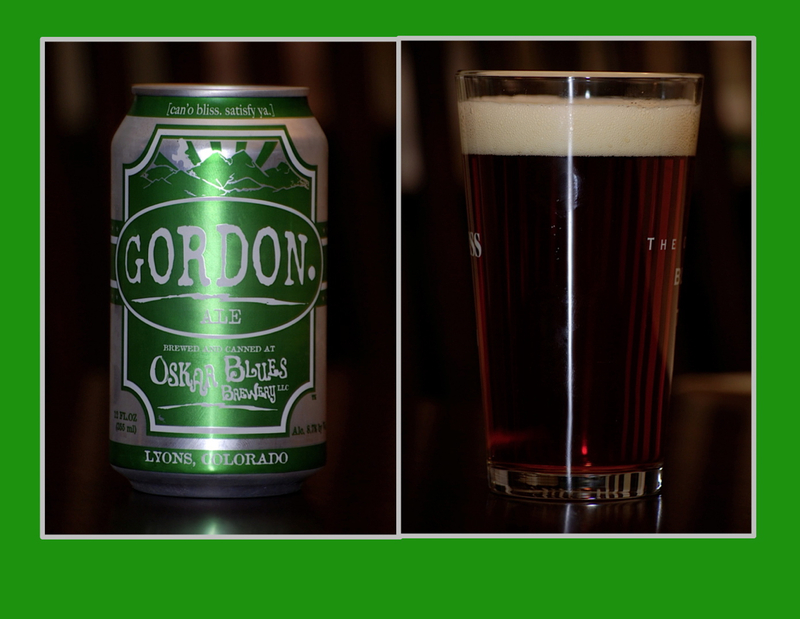 The Gordon Ale is a Double IPA and has an ABV of 8.7%. This should be one potent brew! Appearance: Reddish/Amber. Half inch head that dissipated rather quickly. Minimal lacing as it subsides. Aroma: Sweet smelling. Reminds me of maple syrup. Faint hop aroma. Taste: Malt sweetness at first, followed by some moderate hop bitterness. Long dry finish with a slight bitter aftertaste. Dale’s Pale costs $10/6 pack, while the Gordon Ale is $12/4 pack. So when I first tried it, I kept asking myself, “Is this beer better than Dale’s Pale Ale which is significantly cheaper?”. We’ll call this the sticker shock factor. The Phillies lost Game 1. I am enjoying this beer much more the second time around. Although it has a high alcohol content, it doesn’t taste particularly boozy, and it strikes a very nice balance between malt sweetness and hop bitterness. I give this beer a B+. If I hadn’t had the Dale’s Pale Ale, which I think is a great value, I might have scored this beer a bit higher. During a Boozing Dancing beer prisoner exchange over the weekend I was able to liberate and sample a Gordan Ale for the reasonable cost of one Summit Brewery Horizon Red Ale. For my two cents in this Brew Review I found the Gordan Ale to be herbal with a hint of citrus wrapped in a big hoppy package. While I enjoy the crisp lighter canned refreshment of the Dales Pale Ale from Oskar Blues the Gordan Ale with its heavier feel and slight alcohol burn is unlikely to find its way into my summer pool cooler. The heavier canned brew may however find its way into the cargo pockets of my ski pants for post snowtubing enjoyment around the fire this winter. Good canned beer! More proof that God loves us and wants us to happy. Well said Herr Wookie! Twas a fine exchange of beers. The Summit Horizon Red Ale was quite tasty. What’s the Miller Lite to Gordon Ale exchange rate? 20 to 1? Someone dumped a bunch of that crap in my beer fridge at a party over the summer and I need to clear space for some real beer. Can’t bring myself to throw it out so I need to find it a home …. interested? Maybe Miller Lite would work as an engine degreaser? Someone left Miller Lite? At your house? Man! You must have really pissed somebody off. How is it as a fertilizer? I have this really brown patch of lawn over by the swing set. I think a small animal attacked the grass from underground. Maybe we can pour the Miller Lite down the holes and see if we can get it drunk. That’ll teach them to mess with my grass. The brown patch in your lawn is where I have been disposing the Bud Lite Lime that was also left at my house … I don’t think the Miller Lite will improve the lawn.